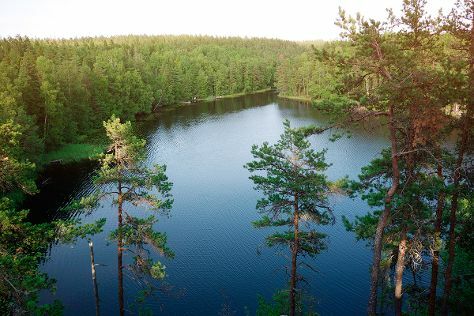 On the 29th (Sun), explore the wealth of natural beauty at Nuuksio National Park. 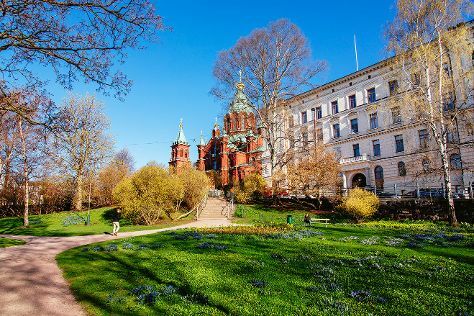 Get ready for a full day of sightseeing on the 30th (Mon): explore the striking landscape at Hiidenkirnut and then wander the streets of Katajanokka. To find ratings, photos, more things to do, and other tourist information, use the Helsinki trip itinerary website . If you are flying in from Israel, the closest major airport is Helsinki Vantaa Airport. Expect a daytime high around 19°C in September, and nighttime lows around 8°C. Cap off your sightseeing on the 30th (Mon) early enough to catch the train to Kouvola. Kouvola is a town and municipality in southeastern Finland. Your day-by-day itinerary now includes House of Rock Bar. On the 30th (Mon), take a peaceful walk through Niivermaki Nature Conservation Area, look for all kinds of wild species at Arboretum Mustila, and then get a taste of local nightlife at House of Rock Bar. For reviews, more things to do, maps, and more tourist information, refer to the Kouvola journey planner . Traveling by train from Helsinki to Kouvola takes 1.5 hours. Alternatively, you can drive; or take a bus. In September, daytime highs in Kouvola are 17°C, while nighttime lows are 9°C. Wrap up your sightseeing on the 1st (Tue) to allow time to travel to Koli National Park. Your day-by-day itinerary now includes Paimenen Polku Trail. On the 1st (Tue), hike along Akka-Koli Hill. On the next day, hike along Paimenen Polku Trail and then tour the pleasant surroundings at Paha-Koli Hill. To find other places to visit, more things to do, and other tourist information, read Koli National Park trip itinerary builder . Traveling by car from Kouvola to Koli National Park takes 5 hours. In October, daily temperatures in Koli National Park can reach 6°C, while at night they dip to 0°C. Cap off your sightseeing on the 3rd (Thu) early enough to travel to Kuopio. Kuopio is a city and a municipality located in the region of Northern Savonia, Finland. Kick off your visit on the 3rd (Thu): take an in-depth tour of Riuttala Farmhouse Museum, admire all the interesting features of Tahko Farmi, and then enjoy some diversion at Vainolanniemi. Keep things going the next day: take in nature's colorful creations at Snellman Park, explore the world behind art at Kuopio Art Museum, don't miss a visit to Satamankulma, then take in breathtaking views at Orinoro Gorge, and finally take in the spiritual surroundings of Leppavirta Church. To find other places to visit, photos, maps, and more tourist information, read Kuopio trip itinerary planning tool . Drive from Koli National Park to Kuopio in 2.5 hours. In October, daily temperatures in Kuopio can reach 7°C, while at night they dip to 1°C. On the 5th (Sat), wrap the sightseeing up by early afternoon so you can travel to Turku. Start off your visit on the 6th (Sun): relax and rejuvenate at Ispoinen Beach and Sauna, get engrossed in the history at Ett Hem Museum, and then step off the mainland to explore Vepsa Island. To find ratings, photos, and more tourist information, go to the Turku vacation planning tool . You can fly from Kuopio to Turku in 5 hours. Alternatively, you can do a combination of flight and train; or drive. In October, plan for daily highs up to 10°C, and evening lows to 1°C. Finish your sightseeing early on the 6th (Sun) to allow enough time to drive to Kimito Island. Kick off your visit on the 7th (Mon): explore the world behind art at Soderlangvik. To find photos, maps, where to stay, and other tourist information, use the Kimito Island trip planner . You can drive from Turku to Kimito Island in 1.5 hours. Alternatively, you can take a bus. In October, daily temperatures in Kimito Island can reach 10°C, while at night they dip to 1°C. On the 8th (Tue), you'll travel to Helsinki. On the 8th (Tue), steep yourself in history at Seurasaari Island and Open-Air Museum and then take a stroll through Katajanokka. Getting from Kimito Island to Helsinki by car takes about 2.5 hours. Other options: do a combination of bus and train; or take a bus. On the 9th (Wed), you're off tohome.